Restore Windows 7 | How to Restore Your Corrupted Windows 7 Files? Discovered! What to do to restore Windows 7 settings? First of all, do you know the system restore feature in Windows 7? System Restore keeps track of the changes you make to your system, including the software you install and the settings you make. 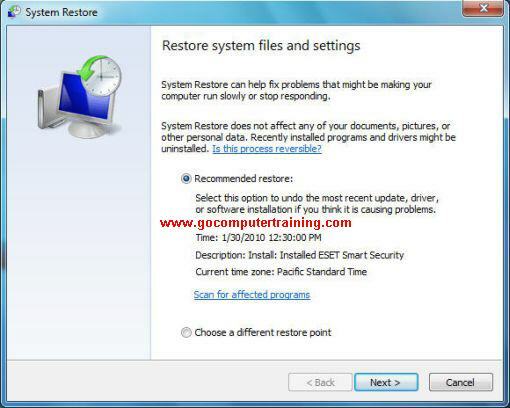 If a hardware change or a software installation that causes the system not to run properly, you can use System Restore to return the system to the way it was at the last restore point. A restore point is an identifiable point in time when you know your system was working correctly. If your computer's settings are saved at that point, you can use those settings to restore Windows 7 to that time. Normally, Windows 7 automatically creates restore points for the system drive on a periodic basis. But if you want to create a point at specific time, you can create a restore point. If System Restore is not enabled, you can turn it on and set a restore point. Also, you will know how to restore Windows 7 in this article. From the Control Panel window, in the Category view, click System and Security. From the System and Security dialog box displayed, click the System. From the System dialog box displayed, click System protection link in the left pane. From the System Properties dialog box displayed with the System Protection tab displayed the disk on which Windows 7 is installed should have system protection turned on, indicating that System Restore is automatically operating for that disk. If any drive does not have protection on and you want it on, select the disk, click Configure button. 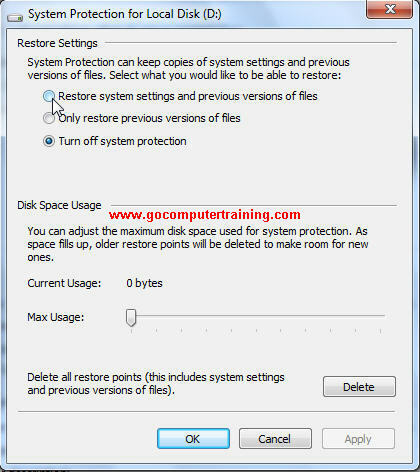 From the System Protection dialog box displayed, select the option Restore system settings and previous versions of files, then adjust the disk space usage as desired, and click OK.
Click OK again to close the System Protection dialog box. From the System Properties dialog box displayed with the System Protection tab displayed, click the Create button. From the windows pop-up, type a name for the restore point and click Create button. The date and time are automatically added, and you cannot change the name once you create it. Click Create again. You will be told when the restore point is created. Click OK and click Close to close the System Properties dialog box. Note: If you can start and operate Windows 7 normally, try to execute the following steps. If you can't make it through these steps without Windows 7 crashing, ignore the following steps. From the System Properties dialog box displayed with the System Protection tab displayed, click the System Restore button. A message explains the restore system files and settings. Accept the recommended setting by clicking on the Next button. To confirm the restore point, click the Finish button. Clicking on the Scan for affected programs link will tell you if any programs have been updated or had a driver installed after the restore point. If you go ahead with the restore, these programs will be restored to their state before the update. Click Yes button from the warning box pop-up telling you that the restore process cannot be interrupted or undone until it has completed. The computer will be restarted. When the restore is completed, you will be told that it was successful. 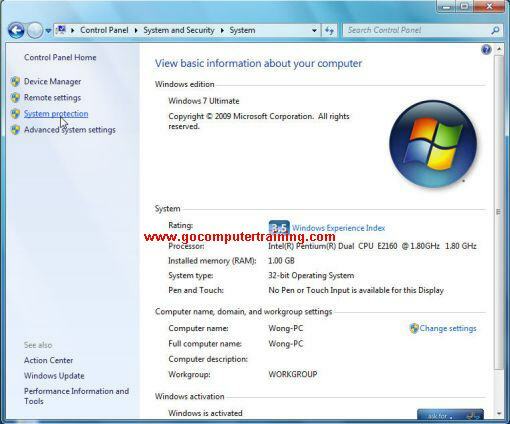 In a default installation of Windows 7, System Restore is automatically installed. If you have at least 300MB of free disk space after installing Windows 7, System Restore will be turned on and the first restore point will be set.